Hey, Drew here and it looks like you have been searching for a review on the Turbo Shopify Theme. I am going to review the theme and then will let you know if it is worth it for you to buy or not for your Shopify store. Turbo was created by Out of the Sandbox – a theme developer. As the name implies, the Turbo theme has an important aspect in mind – speed. Why is this important you ask? I’ll give you a real life example. How many times have you abandoned a site because it was just too slow? As a business owner, this can be a disaster for your store. If pages / products are loading slowly, you are going to lose customers because people simply don’t have the patience to wait for something to load. They will just go to the next site and potentially buy from them. You just lost a sale because of your site’s poor performance. According to Turbo, the theme is optimized for speed and in mobile as well. Just How Important is Site Speed? If you are not aware, about 40% of shoppers online will abandon a site that takes longer than 3 seconds to load. If you are not sure how fast your site loads, try using GTMETRIX and check out the performance of your site. Pay attention to everything, especially the load time. If your site loads in 3 seconds or more, you could be facing up to 40% abandons based on just speed alone. An animated and interactive mini-cart. Promotional sections that are very high impact. Video banner sections that support platforms like Youtube and vimeo. Native MP4 also supported. The turbo theme is highly customize-able with many different settings. It also includes some apps that you may have purchased separately so this can save you money in the long run by avoiding those pesky monthly dues. So, Should you buy Turbo? Turbo ain’t cheap. At $350 that’s a pretty big price tag to pay. However if you are serious about your store and have been thinking your theme is holding you back, this could be a worth while investment. The sales you make as a result of implementing this theme could end up paying for it in the long run. Something serious to consider. You also have a 14 day guarantee so it’s low risk. Are There Any Cons to The Turbo Theme? Look, I love this theme but there is going to be a tremendous learning curve. Fortunately you have support and a theme help center. If you know your way around a Shopify theme then it won’t be much issue to you. You can pick up the Turbo Theme Here. Don’t Feel like Spending $350? As always, I have an alternative for you that I think you are going to love. A similar theme, aptly named “Ecom Turbo” is also available for less than a 3rd of the price. At only $99 it’s got similar features, has speed in mind and also conversions. What I really like about Ecom Turbo is the extenstive training that comes with it. It’s also a full course which walks you through the setup which is pretty awesome. But hey, review it for yourself. 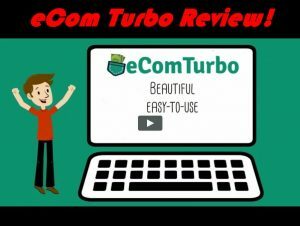 Check out my Ecom Turbo Review to see if this is a good alternative if you want to save some money!